2018 Opel Meriva - New Year New Name Fro Meriva?! 2018 Opel Meriva – New Year New Name?! Opel Meriva entered its second generation in 2010. If you are at least a little into the automotive industry, you know that this car is ready for a redesign. The German automaker is doing just that with a new edition of its favored MPV. The interesting thing is that 2018 Opel Meriva could exit companies Rüsselsheim, Hesse, Germany factory as a crossover rather than a minivan. The changes wouldn’t stop there, but Opel could follow Vauxhall Motors and name their new model – Crossland X. Whether this renaming is going to happen, we will know when Meriva/Crossland X hits the showrooms. Regardless of the name, the new model has already been spied, and we already know a couple of facts about its design. More than ever new Meriva is going to look like a real SUV. Ground clearance will be increased, and it will have some traits of an off-road vehicle. Despite changes to the looks, it will still be far away from being actual sports utility vehicle because German company is trying to reduce its costs. According to reports, the car is going to be created in cooperation between PSA Group and GM which Opel is a member. The first plan included it to be built as a minivan on new Opel/Vauxhall architecture, but this idea was dropped because of lack of funding. That’s why it’s going to use Peugeot sourced platform, and it will be created in Zaragoza, Spain together with C3 Picasso and Peugeot 2008 replacements. Interior wise not much is know so far, but cabin will be developed to suit the needs of future owners who will certainly be feeling at least a little bit like they are inside of an SUV. 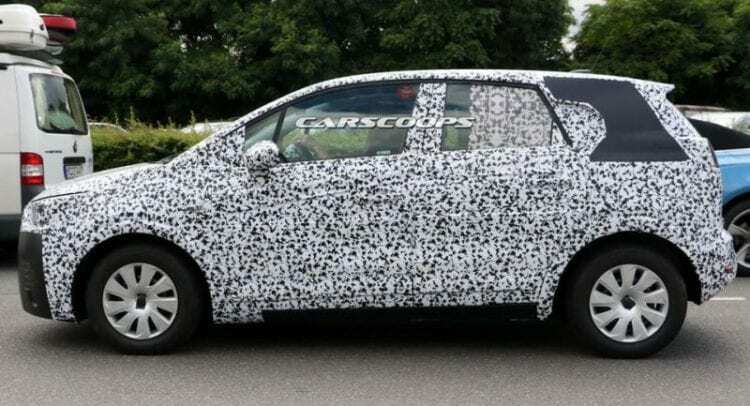 Looking at the spy shots, 2018 Opel Meriva is in last stages of development so the release should be expected in following months if there are no unexpected delays. As far as powertrains go new Opel Meriva/Crossland X, will have a lot to offer. Current generation offers 1.6-litre diesel and 1.4-litre petrol units. Both of these engines come with five-speed manual, six-speed manual, and six-speed automatic transmission. The new version will probably have a couple of new choices that include; 1.2-litre three-cylinder petrol and more powerful 1.6-litre four-cylinder diesel unit. The transmission will be manual as standard and automatic as an optional feature. Despite transferring from MVP to SUV, the 2018 Opel Meriva will not jump too much in price. Main reason is that Opel saved some money on development by entering into cooperation with PSA Group. The current edition of Meriva costs around $18,000. New styling means new competition, and that’s why this model won’t battle minivans but the likes of 2017 Nissan Qashqai and Skoda Yeti.